Traditional names are losing out to unique ones, today's grandparents' names are becoming popular again, parents are experimenting with variations in spellings - or they're simply making new names up. 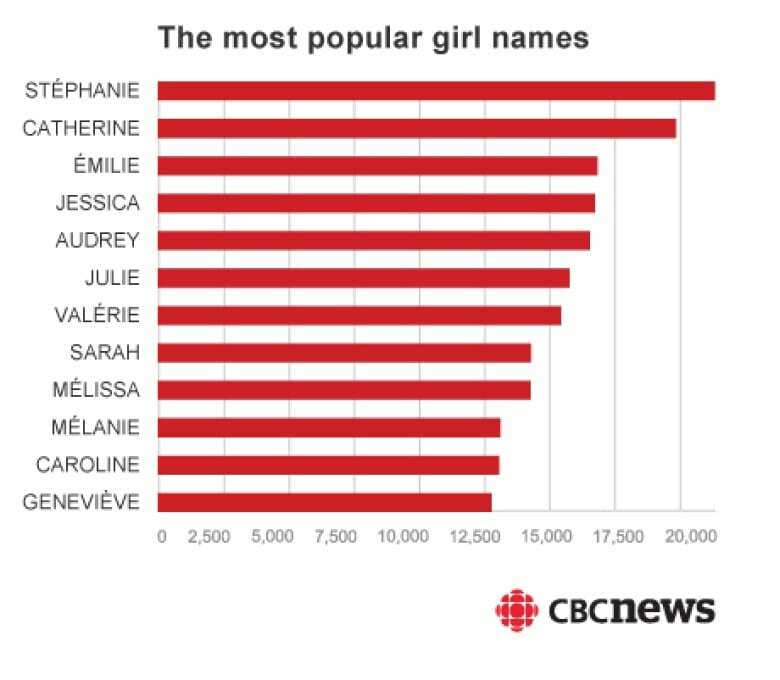 Decades from now, Stéphanie and Alexandre, the most popular names in Quebec, will sound like grandparents' names. And the names of today's grandparents, such as Olivia and Arthur, are on track to become babies' names again. The names parents give their newborns have undergone a sea change in the last 35 years. Names popular just a few years ago are losing out to names from generations ago, or more common names are being given a new twist with a subtle spelling variation. 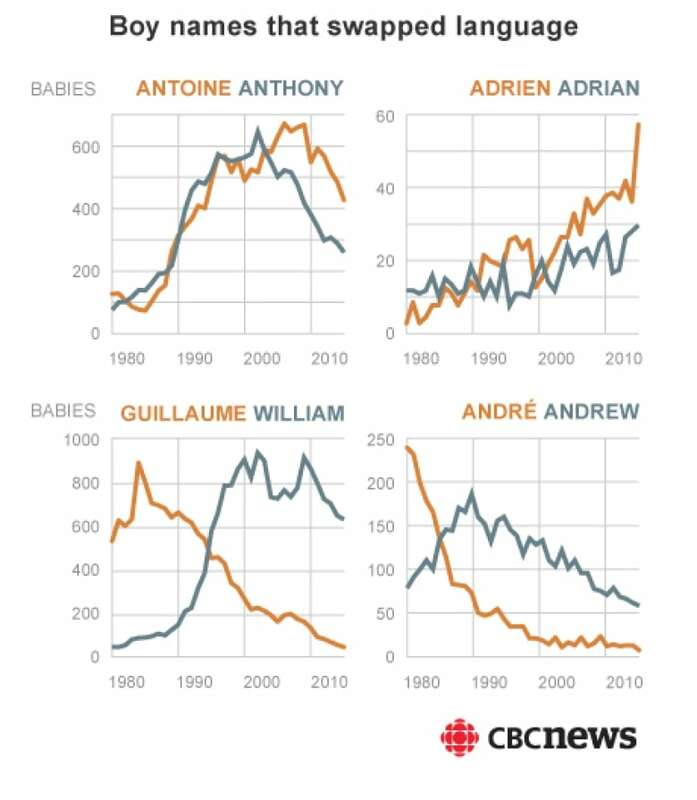 Francophone parents, who'd once be considered crass for giving their baby an English name, are now choosing those names over French ones. And compound names, like Jean-François and Anne-Marie, so distinctively Québécois, are disappearing quickly. All these trends reflect changes in Quebec society, whether influenced by immigration, popular culture or by the rejection of religious traditions, according to sociologist Laurence Charton of the Institut national de la recherche scientifique. 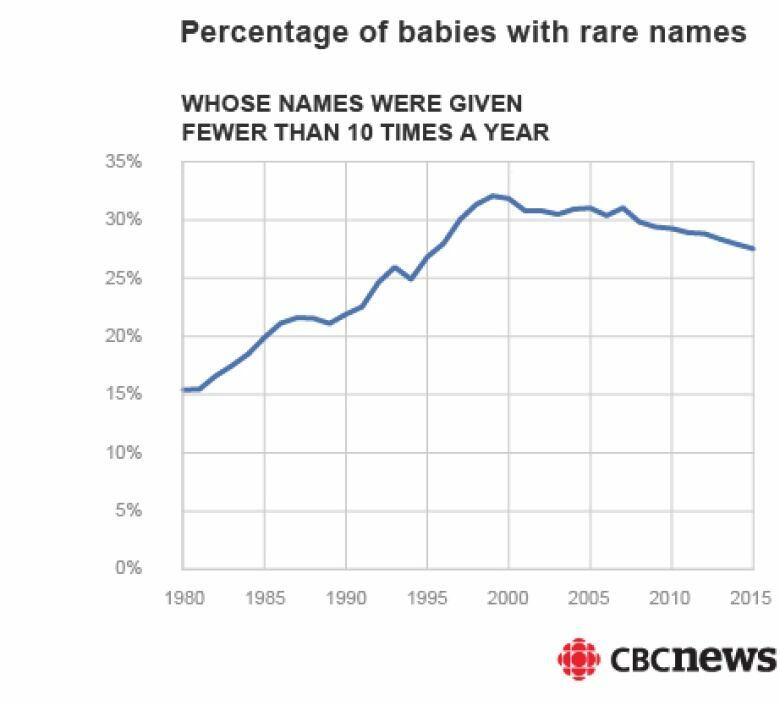 CBC analyzed data on babynames going back to 1980 and asked Charton to put the findings into cultural context. 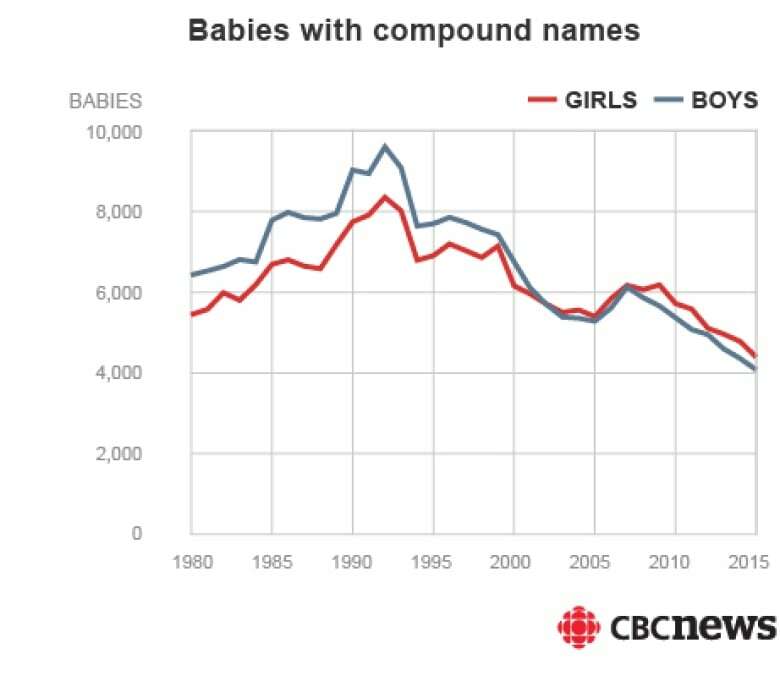 Here are the 12 most popular girl and boy names in Quebec since 1980, by total number of births. But look at the trends for each of those names. You'll see that most have been plummeting in popularity. More and more, parents are choosing unique names for their kids. It's a trend seen across the Western world. "We want to be original — but with limits," Carton said. "The originality can come in the spelling of the name. 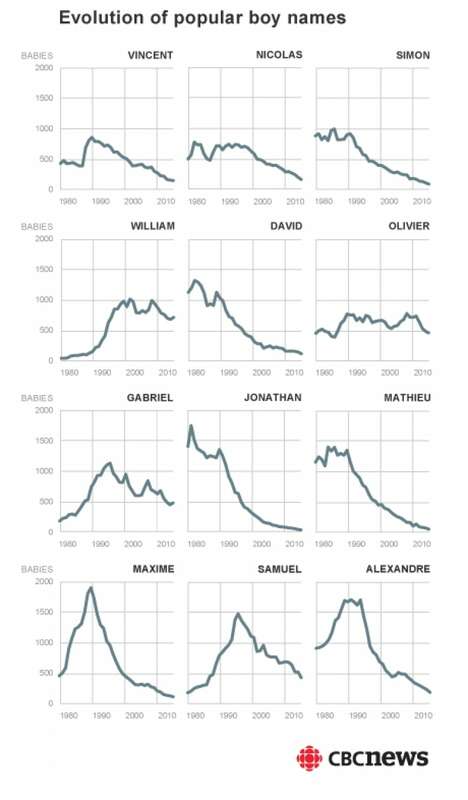 For example, the name Heloise with or without an H."
The chart below shows the proportion of babies each year given a rare name — that is, a name that is given to fewer than 10 other babies that year. This preference for the unique follows a major shift in Quebec's Civil Code in 1981. Before that year, children could only take on the surname of the father. This new freedom gave couples new options on how to name their babies: double-barrelled last names, or using a parent's last name as a child's middle name, for instance. "This also affected the choice of the first name," Charton said. "So we have to look at the choice of name with the context of the surname." 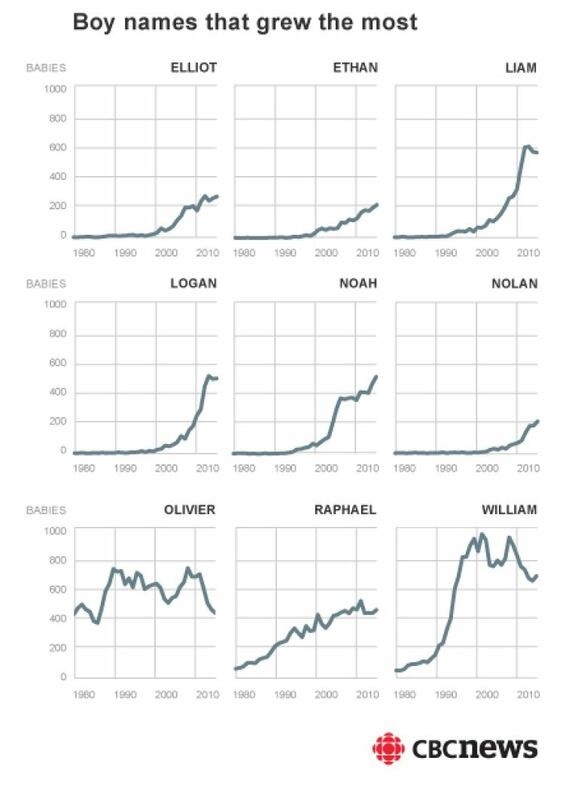 Here are the names that have grown the most in popularity since 1980. Notice traditionally English names for boys that stand out: Elliot, James and Logan. For girls, Mia and Victoria (not shown) have been on a constant rise. "Parents feel more freedom in their name choices today," Charton said. Immigration plays a role, as immigrant parents give their children names from their home cultures. But there's also less disapproval of English names than before. "There's less of a feeling of danger around language," she said. Compound names, a peculiarity of Latin cultures, have been losing favour in Quebec. After hitting a peak in the early 1990s, they are at their lowest now since the data has been collected. 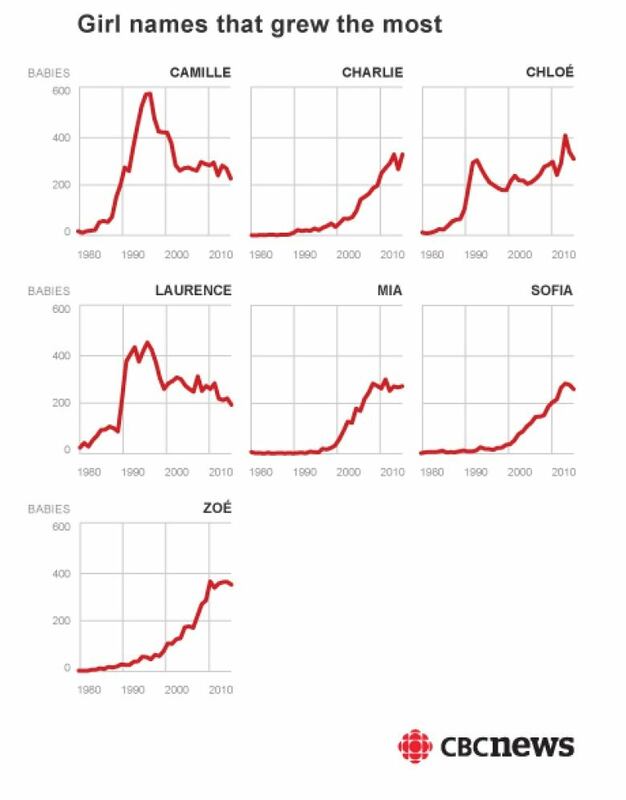 Marie-Ève, the most popular compound name for girls by total birth, plummeted from a high of 1,200 births in the early 1980s to only a couple in 2015. Likewise, more than 1,000 boys were named Jean-François in 1980. Today, hardly any are. Charton says this reflects the increased secularization of Quebec society, since compound names have a rather Catholic association. "In the old days, when a boy was baptized, he automatically received the father's name or Joseph as a second name," she explained. The equivalent for girls was Marie. Today, if a compound name is used, it's to associate oneself with a social group, or in certain cases, to transmit a name from one side of the family. The letter "e," once the most popular ending for names of both genders, has taken a hit in recent decades. 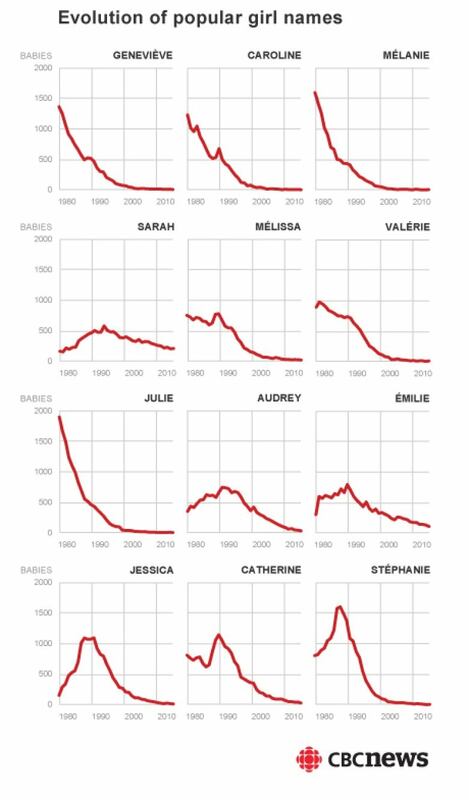 In 1980, it capped nearly 65 percent of all girls' names. 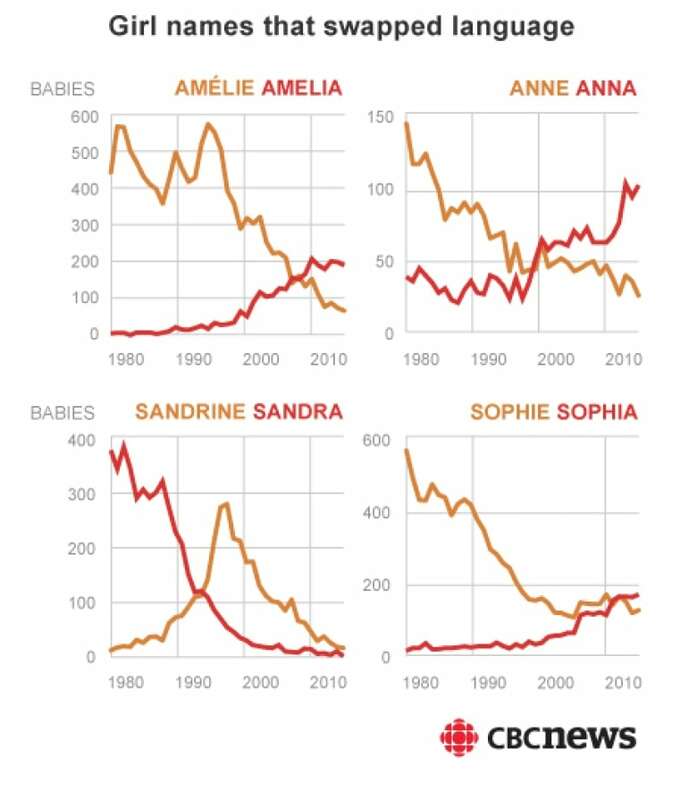 Thirty years later, fewer than half of girls born were given a name ending in "e."
On the other hand, names ending in "a" have seen a big boost in popularity among girls. Charton ascribes this to two changes. One is immigration, especially from Latin American countries, where nearly all female names end in "a." The second is how the vowel is pronounced in certain regions of Quebec, where the final "a" is more of an open back-rounded "o" (the phonetic symbol [ɔ]). "It wasn't seen as a good sound," she said. "Today, people might not be bothered by this sound anymore." As for boys, the letter "n" is the most common letter to end a name with, but only in less than a fifth of all names. Boys' names, in fact, end in a greater variety of letters, with "l," "r," "s," and "y" being fairly common. The growing preference for girls' names ending in "a" means that the Latin versions have, in some cases, surpassed the French ones. Anna has overtaken Anne, and Sophia or Sofia beat Sophie. 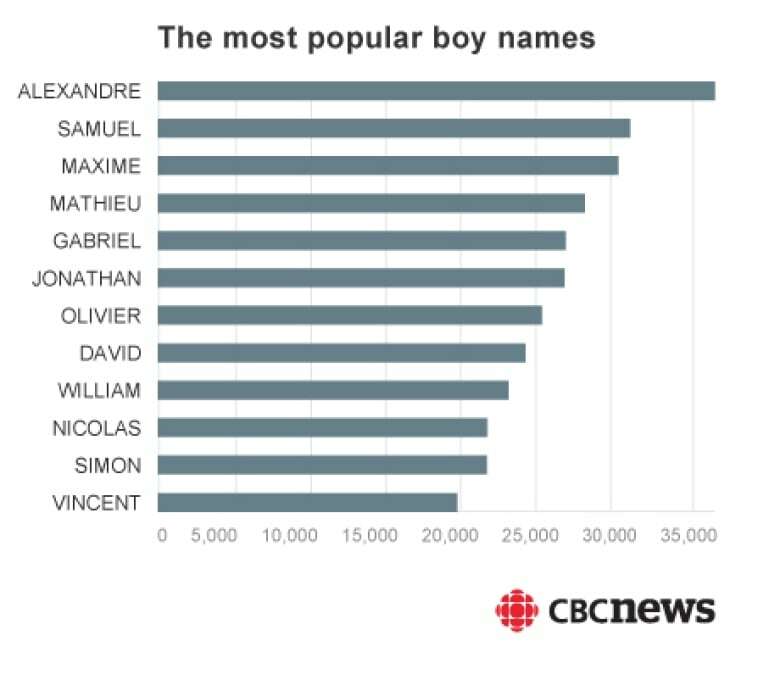 The language flip is most apparent with some boys' names: William long ago overtook Guillaume in popularity. Beyond showing less of a distaste for English names, there is a growing taste for names with social status, Charton said. William, Anne and Elizabeth, names growing in popularity, are names associated with royalty. Most names in the data are clearly more popular with one gender than another. There are a few instances of gender mismatches, such as girls being named Richard or boys called Marie. It's likely in most cases, they are data entry errors. But some names show an undeniable ambiguity in gender. Names such as Ariel switched genders completely over the years. Here are 14 such names. Are Quebecers influenced by popular culture? 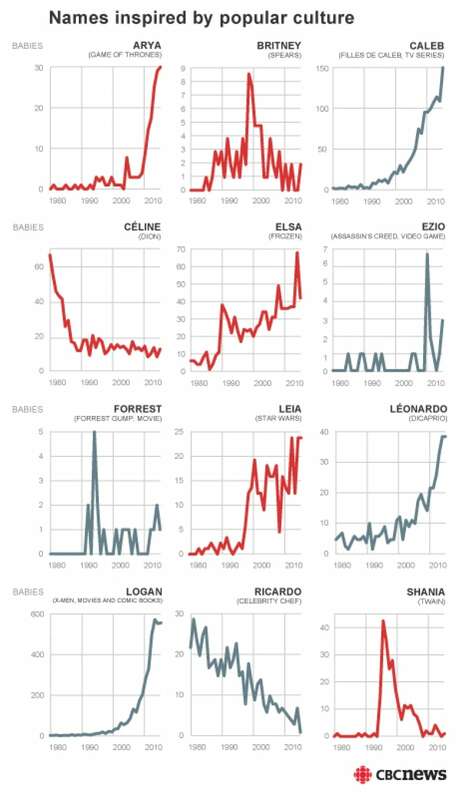 A few names seem to peak around the same time that movies, TV shows and novels with compelling characters become hits. Others seem fashioned after musical stars. Shania peaked as a girls' name in 1996, after the release of Shania Twain's hit album The Woman in Me made her a commercial success. At least nine girls were names Hermione after 2003 (not shown), when the second Harry Potter movie came out, and there were precisely two girls named Katniss in 2012, the same year the first Hunger Games movie was released. The popularity of Logan, the given name of X-Men's Wolverine, coincide with the 2009 release of movies that explore his backstory. And most striking, Arya, the name of the brave and clever heroine of the Game of Thrones TV series, has been on a remarkable rise since the show started running.